Prepare your students for the 21st Century through an active learning entrepreneurship curriculum. A Curriculum To Spur Entrepreneurial Thinking In Classrooms. If you let your students tackle a real-world problem, what would they do? Would they push for better cafeteria food? Or create a new app for school scheduling? Would they take on homelessness? Water scarcity? Plastic pollution in the ocean? If you want students to have these opportunities -- and you’re investing in makerspaces, “genius hours”, or self-directed learning -- but you’re not really sure how to spark the design thinking process or guide student ventures, Teen Startup Trainers is for you. From Ideation To Real-World Critical Thinking Applications. 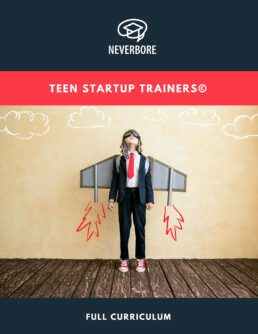 Teen Startup Trainers is a 30-hour pre-packaged curriculum that teachers can use to teach entrepreneurial thinking and strategies to middle and high school students. The curriculum includes design thinking challenges, practical steps to guide students through problem ideation, solution development, and a clear process for developing minimum viable products, pitches, business plans and trade show presentations. Lessons encourage creative problem-solving and student innovation via the lean startup and design thinking methodologies. Students hone valuable 21st-century skills that are relevant to any tasks they may pursue in the future including teamwork and communication. Tips to help teachers implement an approach where testing critical assumptions assist students in developing viable business concepts. Learn various strategies about teaching resilience and how learners can draw from setbacks in the process of moving towards their goals. Teen Startup Trainers uses lessons that showcase teaching by questioning - rather than lecturing which increases engagement with the material. Sample ventures illustrate difficult concepts for students allowing them to see how processes translate to the real world.